This is the complete Day 1 video for Erin's "Complete Core Challenge" series. To view the other 13 classes, you must first subscribe to Cody. Welcome, friends! Today we begin our two-week challenge by heating from the inside out, using the breath of fire to contract the abdominal wall. Once fully charged, we will use cross body activation utilizing full body awareness, by learning small isometric movements that is followed by a unique variation of a traditional crunch that will leave you feeling the burn throughout the day. Erin Kelly is a traveling yoga teacher based in Venice Beach, California. Known for her grace and fluidity of movement, she can often be found playing upside down or cultivating creativity through unique transitions. 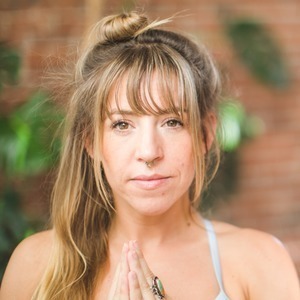 While her teaching style is refreshing and light, she incorporates precise cues and pose breakdowns to help students understand the movements of their bodies and the path to personal growth. A true artist by nature, Erin received a BFA in Oil Painting from The Maryland Institute College of Art. Whether it’s with a paintbrush in hand, or through body movement, she is prudently creating her own form of art and expression. She continues to develop a strong personal practice, and consciously chooses not to be defined by a particular style or lineage of yoga. She has studied under Meghan Currie, Tearson Bickmore, and has received extended hours of Dharma and Rocket Yoga experience under a Yancy Schwartz mentorship. She has been featured in and contributed to publications including Mantra Magazine, Yoga Guide Magazine, and Yoga Journal. These days, you can find her focusing her time on creating unique, informative, and stimulating classes, workshops, and trainings.